The Family Key Charm Necklace with 5 CZ Stones in Sterling Silver is a popular pendant set from Apples of Gold that helps keep each and every family member close to your heart at all times. 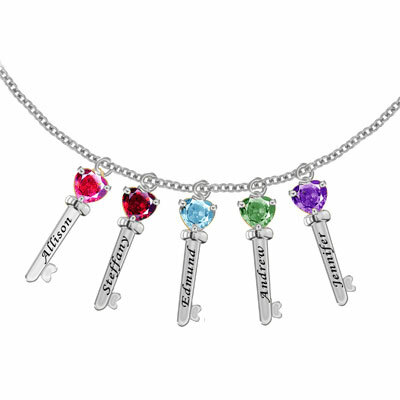 Personalize each key shaped pendant with a beautiful gemstone birthstone inset and an engraved name. Create something that is truly unique and one of a kind and forever remember your wonderful family members and keep them close to you heart- no matter where they may be. The sterling silver used in these pendants is finely crafted and decorated to make stunning pendants that work well with any outfit or style. Apples of Gold delivers the highest quality in every piece of fine jewelry and the family name pendant set is no exception! We guarantee our Family Key Charm Necklace with 5 CZ Stones in Sterling Silver to be high quality, authentic jewelry, as described above.